Today we went to Wellsville (a few miles south of Logan) to the American West Heritage Center. This was my first time ever going there, and today, tomorrow and Saturday (April 5-7) they are having their Baby Animal Days celebration. This was one of our favorite things we have done all year! With this being our first time visiting, we weren't sure what to expect. All we knew was that we had heard it was a ton of fun, and that is an understatement! It was more than anything we could have ever expected! One of the favorite activities that the kids enjoyed was the Candy Cannon. A circular area is roped off, and kids line the outside of the circle. Two cannons shoot out a ton of candy, and after the second one goes off, kids scramble inside the circle to get all the candy they can find. This activity is for eight years old and younger, which makes it much easier for the youngest kids to be able to get candy. There are numerous fun games and crafts for kids to do. 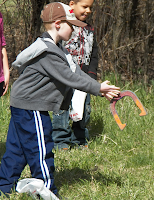 My kids had a really fun time doing the horeshoes game. This was located in the Camp Rendezvous area, which many people didn't realize was there because of all the other activities going on. 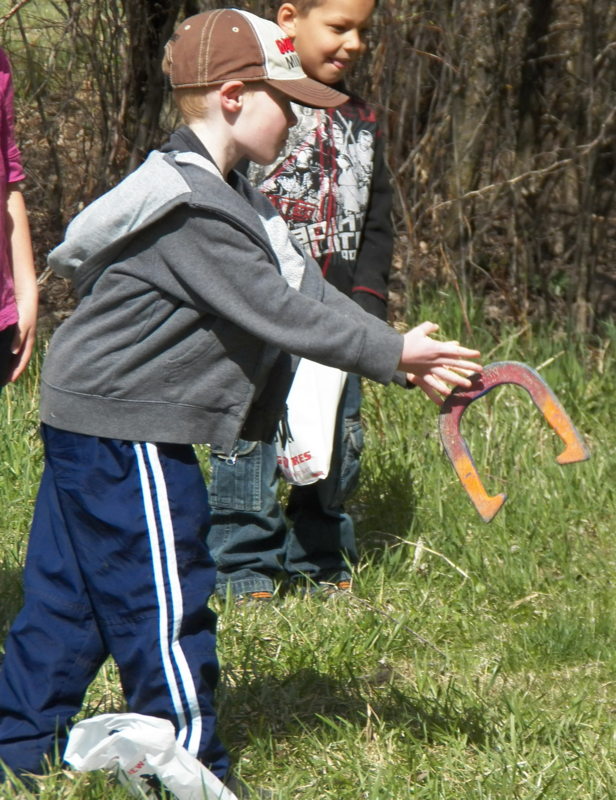 Camp Rendezvous is tucked away down a hill, and is a great area for the kids to learn some fun old-fashioned games. A few times during the day, a gang of outlaws ride up on their horses and rob the Mercantile store. The poor store lady gets taken hostage, and there is a shootout with the sheriff, his deputies, and the outlaws. Keep a close eye, because sometimes the outlaws throw candy on the sheriff; with all the kids surrounding the sheriff trying to get candy, it's easy for the outlaws to make their escape! For a small fee (I think $5 or so), you can enter your kids that weigh at least 30 lbs into the Little Buckaroo Rodeo. After being carefully protected with a helmet and vest, the kids are put on the back of a sheep and let loose in the rodeo corral. My three year old nephew loved this, but my eight year old niece decided she wasn't quite ready to be a cowgirl. For just $5, kids and adults get the chance to ride a mechanical bull. My six year old loved it, while my eight year old wasn't quite ready to try. There is an operator controlling the bull, so the speed and wildness of it is adjusted with each person willing to try. And of course, who could forget the baby animals?! Bear World has brought their baby bears for all to see, and it is definitely worth waiting in line to see! They were the cutest little things, and I could have spent all day watching them! The kids are also able to go in the goat pen and pet the goats. Other animals you will see are baby horses, baby cows, and others. There are a few different wagon rides. One is a large wagon that seats many people, pulled by a team of large muscular horses. Another option is a team of miniature ponies pulling a small sled big enough for small kids to take a try at leading a team of horses. Get there early and spend a ton of time! We arrived about 10:30am, left at 4pm, and didn't get to do and try everything. They are open from 10am to 5pm. Buy your tickets ahead of time. It will allow you to walk right in instead of waiting in line to purchase your tickets. Don't be afraid of the lines! When you first arrive, if you haven't purchased your tickets ahead of time online, don't worry....the line goes fast! Also, the lines for all of the other activities once inside look worse than they are, and are worth every minute! Bring cash. Many of the little games to play don't accept credit/debit cards, and you will need cash to play them. Some of them are free, like the bean bag toss. If you don't ever bring cash, like me, they do have ATM machines around the Center. The drive from Salt Lake City is about one hour and twenty minutes. It is a beautiful drive and goes by really fast. Take I-15 until you get to Brigham City. Take the first Brigham City exit, head eastbound, and follow the signs to Logan. Stay on that main road that takes you through the canyon, and do not turn off any roads that say Wellsville. The American West Heritage Center will be on your left hand side of the main road. It's hard to miss! For more information, visit the American West Heritage Center website.